Now she's written this amazing book! All of the projects in this book speak to me. Maybe that's because I have a lot of boys/man in my life. I am always looking for something ultra slick! the top of my to-do list, is Odd Ball. I love everything about it from it's simplicity to it's punchy pops of color. Trust me, you NEED this book! 1. Leave a comment telling me what you're giving your guy for Father's Day. 2. Make sure that you leave an email for me in your comment if you are a no-reply blogger. Alright, you have until Monday evening to enter. p.s. check out www.amyscreativeside.com tomorrow for another chance to win. I'm blessed I have the husband I do, and my kids have him as a daddy. Thanks for the chance at winning this book! Looks awesome! :-) my guy get's a handmade mobilephone case! The books looks wonderful!! Fathers Day? Well... I did pick up a mango slicer from Crate and Barrel for him :)... maybe I better win and make him a quilt from this book! ? thanks! My dad passed away years ago, but I will remind my daughter every year about observing father's day for her dad, as she tends to forget dates. Have fun on your bike! Looks like you have a quiet neighborhood in which to ride it. I believe staying on trails is the safest--too many accidents occur with bikes when riding on regular roads. Father's Day? I guess I will have to see what I get this weekend and go from there - ha ha! Seriously, we did put in a gift moratorium, but I bet we break it. Love this book and I just might make hime something from it someday.... Thanks for the chance to win. Awesome quilt design, what a great book this would be to have, hope I win!! I'm not sure. My dad is a simple guy and never wants anything. I may just have to go visit him or call him. :) (There is always M&Ms that can be mailed to him too. oh man! i will probably give him...i have no idea! i honestly am more concerned about what to get him for our anniversary next week. i am a little stumped there... xo thanks for the giveaway friend! i hope i win! My husband loves music and money has been really tight so he's given up his iTunes fun money. So, I've been squirreling away my fun money on iTunes giftcards. He's going to be so thrilled - and surprised! We are taking my husband to the Dodger game for Father's day. My guy is really hard to buy for so I have fits picking what to give him. I've wanted to get a quilt made for him the past two years but didn't feel I was ready since I just started learning how to quilt a little more than two years ago. Plus the fabrics I already purchased are all large print and when purchased I had no idea what kind of trouble that was going to give me. oops. I do have a few options as far as quilt patterns picked out now and this book appears to have a number of new options too. As of right now though, all I know is that I'll be making him an awesome dinner and breakfast that day. You're right! I need this book! I have two daughters who have received several mommy quilts, but my four boys are still waiting. 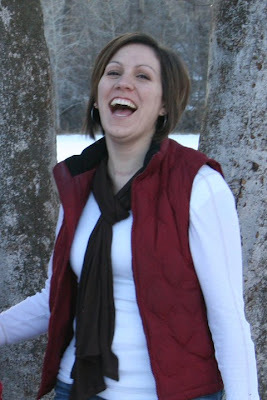 I would love to win and get started on creating a keepsake for them. Thank you! It's Mother's Day here, so I haven't thought about FAther's Day yet!! I think my husband needs a new dressing gown for our cold winter mornings! I have NO CLUE what I might get for my husband for Father's Day. I will probably just cook him a favorite meal/dessert and let our grown kids lavish presents on him. I would love, love, love to give my hubby a recliner for Father's Day, but it's not in the budget right now. My hubby's Dad is 92 and the thing he would love best is time with his family. Thanks for the giveaway. 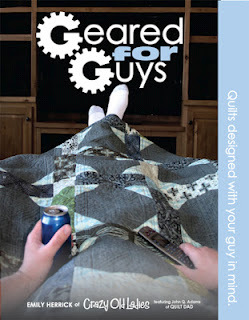 I think it is awesome that there is FINALLY a quilt book with GUYS in mind. My dad likes to have all his kids come over to his house on father's day, I usually don't bring a gift, just a funny card. it would be nice to make him a quilt with a golf theme. I am giving my guy a really good hug and declarations of my deep love. We'll be at my parents helping my brother celebrate at his wedding around Father's Day, so I'm not sure. My 6 year old usually has specific ideas for what to get her dad, who knows what she'll come up with. I'll probably make a stepping stone for MY dad's garden. I would love to win this book. We don't give gifts for mothers day and fathers day to each other as we have no children. I would however make one of these quilts and give to my husband for his birthday or Christmas. Man! Isn't that too far away to even think about... Maybe something Home Depot related? My heart says a golf club but we'll see. But with a lot of sons and grandsons, I would love a guy quilt book to make quilts for my men. I think my man will be getting a camping trip that will include fishing and bike riding. This book looks way cool. I will have to buy it if I don't win. But if I win then I can buy more fabric because I will have saved some money not buying the book. Love how that works in my head. We usually just do funny cards for mother's day & father's day. But I hope to have the quilt I'm making for him finished by then. Thanks for the chance to win. Well as I am pregnant with our first child, I know this fathers day I need to start a great tradition for my husband but don't know yet what that should be. Perhaps I should read all the ideas here but I just don't know yet. My Dad always got to have full plates of ice cream Sundays for fathers day, but my husband isn't as big of an ice cream junkie.... I will be brainstorming. Thanks for the chance to win the book, looks perfect for inspiring me to make something special for my man. Oh my goodness, Father's Day? Haven't even thought about it! We've just gotten through my Dad's 70th birthday surprise party and my son's college graduation and an early Mother's Day for my MIL. Need a minute or two before I can think about Father's Day. Yes! Love the Odd Ball quilt. What a neat design. I'm not sure about Father's Day yet. My Dad has been gone for several years now. My son, who is a father, is in the USMC and is currently deployed in Afghanistan. He will not be home by June so I'm sure we will all get together with our DIL and grandson and make it a special day. We will have a big celebration for my DS and DH when he returns. 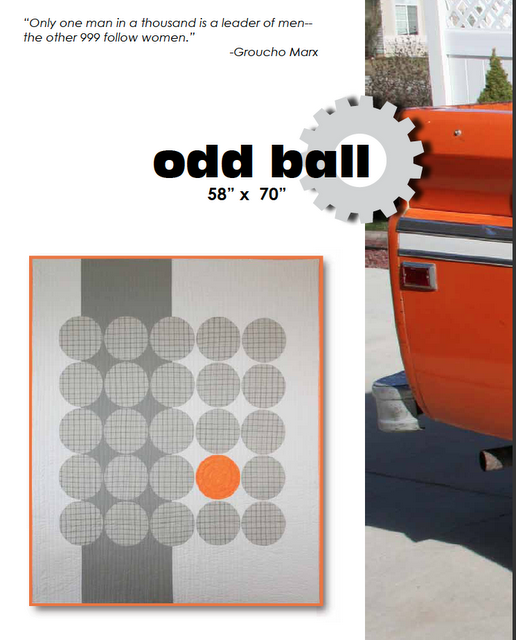 I love the odd ball quilt - my favourite of those I've seen! My Dad died 20 years ago but we still have my FIL! He always loves something for his garden! I am getting something for his new iPad. Trying to decide which accessory. For Father's Day we will probably spent the day on the lake fishing...if the weather is nice. Thanks for the chance to win this great book. My dad is a passionate runner. I constantly needs running shoes and socks :o) Thanks for the giveaway! Hmmm, haven't decided on a father's day gift yet, but we have a tradition of silly gifts - in the past I've given him flowering shrubery and curtains for the livingroom :) thanks for the giveaway! Father's Day...wow - haven't even thought about it yet. Probably a gift certificate to Cabela's. I love that orange dot quilt. It is so great. We started a weird tradition when our kids grew up...Since I am NOT my husband's mom and he is NOT my dad, we don't give each other gifts on this day but instead give a loving card and allow them to enjoy their day. We hope we taught our children while they were young to appreciate their parents and spoil them on Mother's and Father's day. So on Father's day, I will be missing my dad and thanking God for my husband. Not a weird tradition at all. I don't buy presents for my husband either. I do make him a card! Still thinking about fathers' day but I plan on making a new wall hanging for his office and I also found a collapsible ladder that he has wanted. I always give my husband a hand-made card and write all kinds of romantical messages with appreciation for helping me raise my kids since they were 8 and 10. We don't do gifts, per se. I would LOVE to win this book! It looks fabulous! And I'll be writing down some of these gift ideas from the comments for birthday present ideas... thanks for the help everyone! For father's day, we are planning a freezer paper stencilled tee painted by me and the children. But I would love to make one of these quilts for him too. Maybe I should give my guy a quilt for Father's Day!?! Thanks for a chance to win what looks like a great book! Haven't decided on Father's Day yet... Thanks for the chance to win! My guy is getting a barbecue for Father's Day... Thanks for the chance! 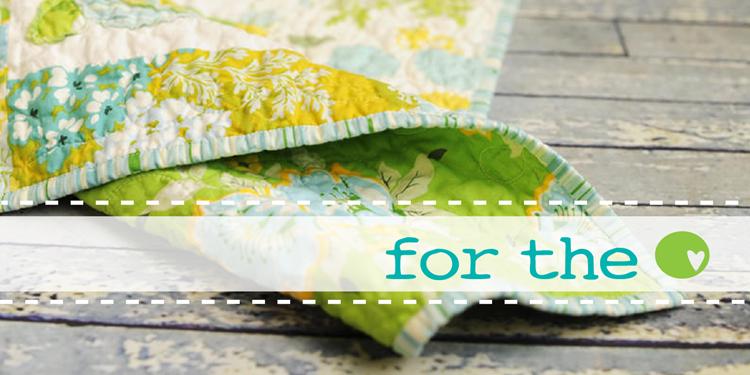 LOVE what I have seen so far about these quilt designs.